I am asked quite often my opinion on the best nyc photography locations and spots instagrammable spots here in the city. Whether you are a blogger, photographer, tourist with a discerning eye, or someone looking for locations for a wedding or engagement shoot, hopefully the below recommendations can be of help. Below I am discussing some of my favorite places to shoot as well as a few tips and tricks for navigating the busier locations. If you are interested in seeing the original posts, just click through on any of the images below. Enjoy! An obvious choice, Central Park is at the top of my list of shooting locations! Spring is an amazing time to take photos here as the cherry blossoms begin budding in April and many of the blooms around Loeb Boathouse start to come out in early May. Some of my favorite locations in this very large park are around the amazing fountains. Grand Army Plaza (5th ave and E 59th St) and Cherry Hill Fountain, (center of the park at 71st street) are two of the best. The prettiest and most photographed bridge in the park is the Bow Bridge (just a short walk from Cherry Hill and even with 73rd Street). The Gapstow Bridge (pictured above with me sitting on the edge in the blue bow blouse) is perfect for a more dramatic shot with the city, and The Plaza Hotel, as the backdrop. If you are looking for stately stairs (like in the lilac post above) head to the Bethesda Terrace, which is just south of the Boathouse in the center of the park, even with 72nd street. The cherry blossoms can be found all over the park but the largest cluster is located across from the Loeb Boathouse! I shot an amazing cherry blossom tree earlier this week (as seen here) which was right next to the King Jagiello of Poland Statue! As you can image Central Park can feel bust-at-the-seams crowded, especially on nicer days and over the weekends. I would advise to head out early in the morning if you plan on taking shots in any of these locations to avoid crowds (particularly the Bow Bridge). I also recommend using the Sun Surveyor app to track the location of the sun and figure out what times are best for shooting! I called the West Village home for over five years and it is truly one of the most beautiful and iconic neighborhoods in NYC. From top to bottom, and left to right, I am outlining all of my favorite little nooks in the hood! First stop is Grove Court. This adorable gate with picturesque houses lining the backdrop is located at 13 Grove Street. The private small courtyard is filled with pumpkins in the fall and tulips in the spring, each making for great photo ops. Fun fact, it is about 50 feet away from the apartment building featured in the show Friends (on the corner of Grove and Bedford above Little Owl). In the fall I love taking photos on Leroy Street (between Hudson and 7th Ave). The trees turn the most vibrant yellow color for about two weeks and rain golden leaves. My favorite street is the entire city may be Commerce (at Barrow). The street is lined with quintessential West Village townhouses and turns sharply to the left, creating a great shot. 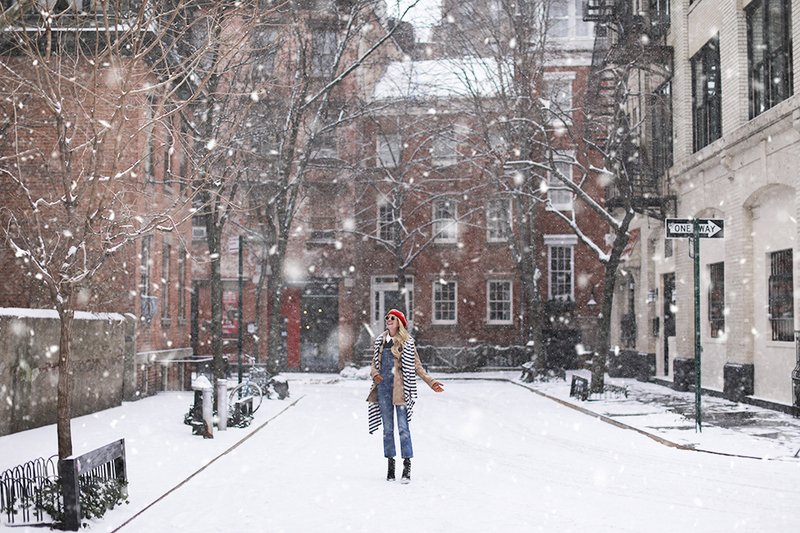 It was especially charming during one of our snowstorms! It’s nearly impossible to pick a favorite townhouse in the West Village, but this cutie with the yellow door and green shutters is high on my list. It sits on West 12th between Washington and Greenwich. At the far north of the West Village sits Abington Square. This cozy park has scores of dark green bistro tables, benches, and chess tables, which all make for great sitting shots. You are within a block or two of incredible bakeries and cafes, should you need a few props! Unlike many other neighborhoods in the city, aside from a walking tour group here and there, the West Village is typically not too crowded, making it a relatively easy spot for shooting! I don’t shoot in the Financial District too often, in fact, only on the weekends when there are no crowds of busy workers (no matter how early you get here during the week it is crowded as fidi gets it start EARLY)! The best time to shoot is actually on holiday mornings (if you are ambitious like me and always trying for the perfect shot). I have shot here on Thanksgiving on my way out of town and also on President’s Day! The intersection of William and Beaver is a great corner and for a more dramatic shot I’ve also had success shooting up Liberty Street by the Federal Reserve (the above all green look). Some of the most dramatic shots in NYC can be taken on and around the city’s bridges. In fact, these are the shots I am most frequently asked about! 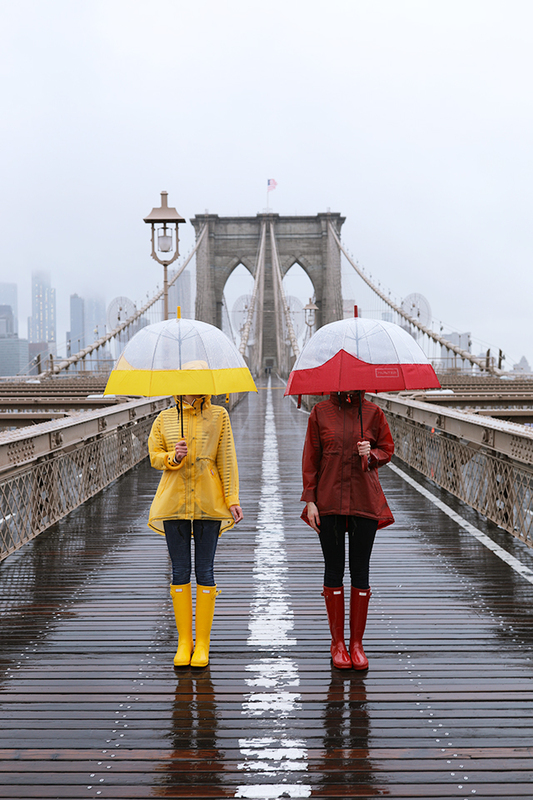 The two umbrella shots above both feature the Brooklyn Bridge. This is my favorite bridge in the city. If you want to shoot here successfully, be prepared to set an early alarm. Really early. This bridge is notorious for tourists and biking commuters, so be patient, and be careful. If you like being yelled at at 6am, try shooting in the bike lane. 🙂 Another reason for an early start here is the sunlight. There is no real coverage when you are up on the bridge above the water, so the light can be quite harsh after the early morning timeframe. Another great shot of the Brooklyn Bridge comes from the Brooklyn side on the waterfront park in Dumbo. The pink rain shot was taken on Pebble Beach in the Main Street Park looking back at Jane’s Carousel with the bridge and the city in the background. Be prepared for gaggles of brides, grooms and weddings parties on Pebble Beach, even on the weekdays. The city side of the Manhattan Bridge is another great spot for a more dramatic shot. The arch and colonnade are beautiful, particularly on sunny mornings when the sun floods through the columns. Fun fact, this monument was designed by Carrere and Hastings, who also built the New York Public Library. They drew inspiration from two classic European monuments, the Porte St-Denis arch in Paris and the Bernini Colonnade in the Vatican City. Typically, there is no one ever on this little strip of land, so no need to worry about people, just lighting! One of my favorite neighborhoods for quintessential NYC shots! I adore the wide cobblestone streets of Soho and it’s historical cast-iron buildings. I typically enjoy shooting on the streets that run north-south as the traffic is lighter and the light is usually better. I also prefer to shoot a bit further south closer to Canal Street as most of the historic buildings sit further south. The first two shots above were taken up Greene Street just south of Broome. The blue building (yellow and gold outfit) sits at the corner of Mercer and Spring Streets and the shot up the street was taken on Mercer as well. West SoHo has a very different feel and is more of a neighborhood, filled with small restaurants and coffee shops. A few of my all-time favorite spots to shoot are Once Upon A Tart and Shuka. The greens and blues outside are so vibrant and play nicely off many of the neighboring cast-iron buildings. Vesuvio Bakery (not pictured) is another great option in that area, presenting another fantastic green background! If you are looking for shots with taxi cabs, head to Grand Central Terminal! The vast majority of the time, they are lined up right out front on 42nd Street. Again, and you probably sense a theme developing here, but it’s a crowded spot, particularly during rush hour when commuters are heading in and out to catch trains (and are typically in horrible moods). I’ve had the best success here during off hours like 6am and 10am. Skip the rush hour windows completely! While shots inside Grand Central can be a bit tricky (there are always lots people and the lighting is very yellow), you must stop in, as I don’t think any building in NYC is as beautiful or dramatic. It was actually to be torn down and Jacqueline Kennedy Onassis played a large part in ensuring it stayed a landmark. The Oyster Bar in the basement feels like a little trip back in time and is one of my favorite spots for a glass of champagne and oysters. A few block west on 42nd street is Bryant Park. On the 5th Avenue side sits the New York Public Library. This historic landmark is full of photo opportunities with stairs, granite benches, fountains, and courtyards galore. Technically you need a permit to shoot on the stairs and under the terrace. If you are just taking a selfie or a few casual pictures, clearly it is fine, but if you plan on taking wedding photos with a crew be prepared to present a permit. On the back side of the building is the park. 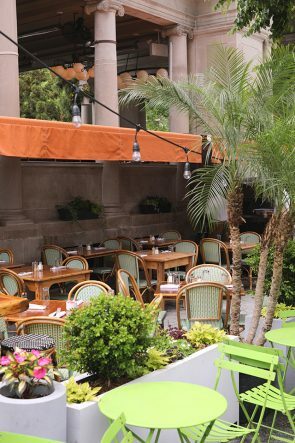 More bistro tables, greenery, and smaller monuments, provide a host of great photo ops! This side is not great so great to shoot in the winter as it transforms to shops and an ice rink, but is beautiful in the spring and summer. I love a great cafe shot, and NYC is full to the brim with them, so I want to round up a few of my favorites. I am starting from top to bottom, left to right! Caffe Dante in Greenwich Village is picture perfect with wicker chairs and gold foiled signage on the glass. There are only a few tables outside, and it can get crowded, so arriving right when it opens is key. If you like shooting indoors, the ornate, tiled bar is also strikingly beautiful. Epistrophy is another favorite cafe on Mott Street in Nolita. It features bench seating out front and a beautiful green hue on the facade of the building. The chocolate chip banana bread is a must! So, Seamore’s on the corner of Broome and Mulberry is technically not a cafe at all, but I wanted to include it on the list anyways. The white exterior, graphic corner column, and black and white umbrellas contrast nicely with the green seating. I love this location for more optic black and white shots! Cha Cha Matcha is right across the street for all of your cute cup selfie and detail shots! The Pavillion, a seasonal indoor/outdoor restaurant on the north end of Union Square Park is another lovely option for outdoor shots. The amazing plants, both inside and out, contrast nicely with the orange tables and awnings. Union Square is also the home of the famous Greenmarket, a lively outdoor market that is open Monday, Wednesday, Friday, and Saturday. So, quite easy to get market shots to go along with your cafe shots! Cafe Colette in Williamsburg has made an appearance on the site on quite a few occasions. The bench on the front corner provides more of a vintage feel, while the take out coffee window and outdoor tables in the back provide space for more typical cafe shots. The space is absolutely beautiful inside as well. If you are looking for a #ihavethisthingwithfloors shot look no further! 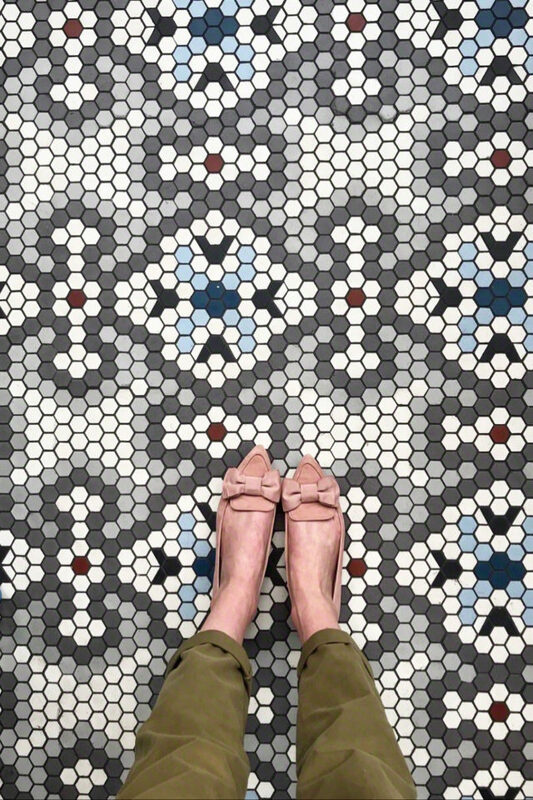 This amazing tile floor is in the front patio of Cafe Standard, the cute cafe at The Standard in the East Village. Another non cafe submission (oops), but Esperanto Restaurant on Avenue C west of Tompkins Square Park, is perfect for high summer shots. The bright colors and graphic elements clash with the mismatched tablecloths to provide such a lively backdrop! Bring your bright accessories! Another get-here-early-or-else spot, the Flatiron district has more than a few must-stop spots for photo ops. The iconic wedge-shaped Flatiron Building itself, is of course the focal point of the neighborhood. The best shots are from the north looking back south upon the building from 5th Avenue or the top of Broadway on the other side of the plaza. Right next door is Madison Square Park, which is home to amazing seasonal art instillations and the original Shake Shack! The park has tons of curved benches and bistro tables for all your seated shot needs. 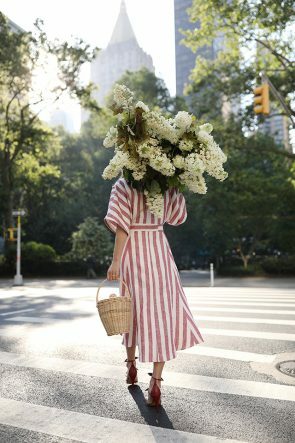 Quick tip – the NYC Flower Market, on 28th Street between 6th and 7th Avenues is only a few blocks away from Madison Square Park. Oftentimes, I will stop there (and buy aggressively large flowers) before shooting in the park! Prospect Park in Brooklyn has a few go-to spots as well! On the Northwest entrance to the park sits Grand Army Plaza. This small sliver of the park hosts the Soldiers and Sailors Memorial Arch, a massive monument that pays homage to those who served during the Civil War. It is huge and dramatic and a beautiful spot to shoot. Inside the park itself, there are a few additional spots that I favor. The Audubon Center, featured above, has gorgeous steps, light fixtures, and arched doorways that span the entire backside of the building. Across the pond is the beautiful Lullwater Bridge where you can get shots looking back at the building. Another great spot off of Parkside Avenue on the south side of the park is The Peristyle monument (not pictured, but where I shot this post). The gorgeous pillars and intricate laid brick patterns provide amazing opportunities for dramatic photos. The little Renwick Triangle on the corner of Stuyvesant Street and East 10th has been a long standing favorite spot of mine. I particularly love this spot on cloudy days in the fall when the foliage pops. There are gorgeous townhouses up East 10th street for stoop shots as well. Oftentimes when shooting here I will also walk a few blocks north up 2nd Avenue to Stuyvesant Square. This smaller urban greenspace features walking paths, statues, and a fountain. Rutherford Place, the bordering street to the west of the park, and the home of St. George’s Church, is very quiet and a great spot to get crosswalk shots. Even more pretty houses on the north side of the park on East 17th Street heading back west to 3rd Avenue. Always the most beautiful locations captured on your post … love ♥️ it! Such a great, helpful post with so many NYC secrets!!! I’m bookmarking this for my next trip back! Thanks for the wonderful summary! You know the very best spots! 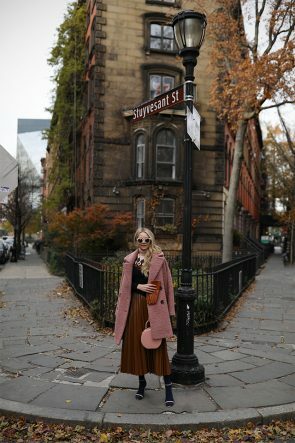 Your NYC style is such great inspiration! You are my favourite fashion blogger and your taste is exquisite. I keep thinking that you may gave been influenced by the 1959 film Gigi (starring Leslie Caron), whose costumes were designed by Cecil Beaton? 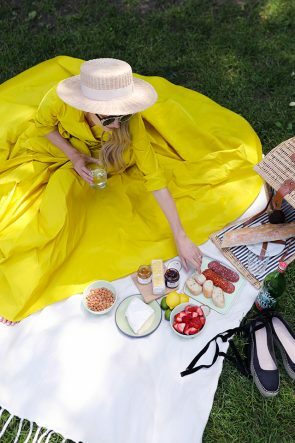 So many of your ensembles remind me of that film, especially your gorgeous hats, and the general feeling of unabashed femininity. Such gorgeous pictures and thanks for sharing al of that! p.s. love your feminine sense of style! Blair – THIS post is everything. I really love when bloggers share knowledge to help others. Of course I love all these looks but I’m especially grateful for sharing some of your fave places. Been blogging for 10 years now but just starting to do more personal style shoots in BK & NYC. Much appreciated. NYC is one of my favorite cities. So vibrant and happening. Great photos, and what gorgeous outfits. Thanks for sharing. Always looking for great spots to photograph! I always loved all of your shooting locations and many of those you’ve mentioned here are my top fave spots in NYC! I’m going to bookmark this for whenever I’m in New York to shoot! What beautiful locations! I love the photos! THIS is amazing!! Thank you so much dear for sharing this spots! Haven’t seen NYC in photos in awhile… thank you for sharing these beautiful pics, cheers! Wow these locations look really incredible to shoot in! Its my dream to do a photo shoot in NYC so will definitely be adding these to my list! So, so helpful Blair!! I have always wondered what your secret spots are to getting such gorgeous backdrops ever since I began reading your blog! Sometimes even the simplest of neighborhoods or turns project the most amazing, quaint shots! I enjoyed reading this so much! Even though I live in the city, this post was so helpful! I love your bold fashion choices that really shine though your great photography. You must have a talented partner in crime! *ps. i am very jealous of these outfits. Such an informative post!! Your backdrops are always the perfect complement to your outfits and I can tell you put so much thought and preparation into capturing the shot, so I appreciate you putting together this thorough guide with all your tips and tricks. You didn’t hold anything back and it’s so helpful! Fantastic list of the best Insta-worthy spots in NYC! I need to save this for my next visit! Thanks for sharing! Thanks for always sharing wonderful suggestions . Bee! I don’t know what’s more inspiring: your incredible list of NYC hot spots or your enviable wardrobe! I’m so excited to make my first trip to NYC next year for my 30th! Thank you for your recommendations! What a generous post, Blair. Thanks for sharing all of your favourite locations around your beautiful city. Wow! This NYC location post is superbly done! Bar none you have THE most beautiful and alluring photos ever! Your ability to coordinate outfits with locations is amazing. Love every one! Thank you so much for posting this!! I am always trying to hunt down your fabulous locations for shooting when we are in NYC! You’re so inspirational! WOW…, ABSOLUTELY AMAZING POST!!! Thank you, thank you, thank you for this amazing post! In case someone was wondering where to get the most iconic, dramatic, and engaging photos of NYC…, you just posted them. Thanks for this wonderful post, which clearly took a lot of time to put together! Thanks for sharing! Perfect post, with incredibly well-styled photos and clothing. Loved it!! I believe more and more we will see people wearing similar outlooks as it gets trendier than ever! If you are looking for spaces for indoor photoshoot, you can check out eventspacesny.com. They have gorgeous spaces with lots of natural light.